The FUA model sealer differs from our regular sealers by reversing the sealing element to the upper jaw and the silicon rubber to the lower jaw. This makes it possible to protect the element from moisture and contamination. Makes a clean and secure seal. FUA is designed for the continuous sealing of thermoplastic films such as polyethylene and polypropylene. Controlled by a plug-in transistorized circuit board, electronic timers and the uniform pressure provided by an electromagnet. These models eliminate operator error in the sealing operation. Once the correct control settings have been programmed, consistent seals are maintained automatically, making the last seal as perfect as the first. 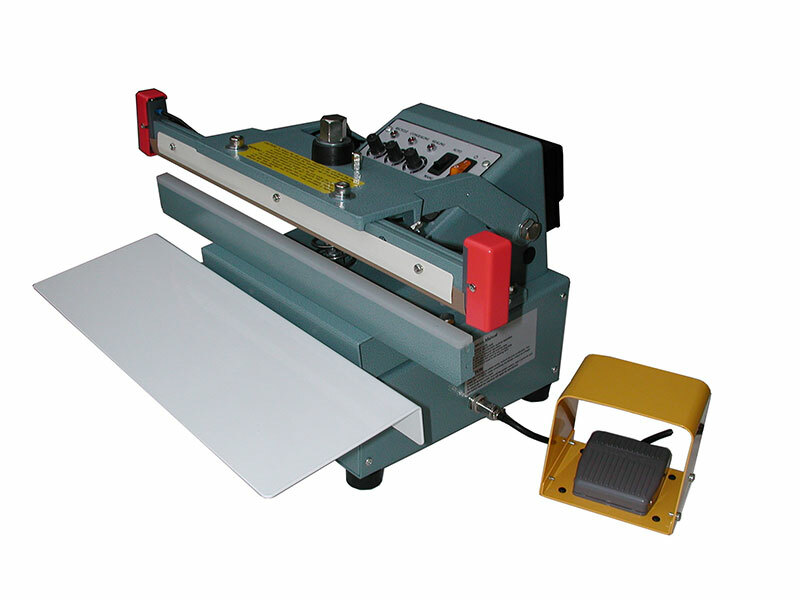 This sealer is ideal for sealing operations in packaging candies, food, stationary, drugs, tools, replacement parts and a variety of other products. Includes an electric pedal for manual operation.